Badrinath  is a Hindu holy town and a nagar panchayat in Chamoli district in the state of Uttarakhand, India. 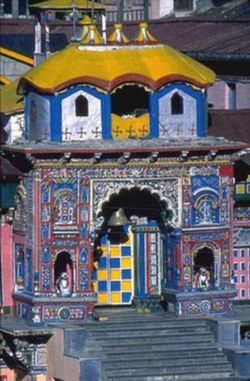 Badrinath is the most important of the four sites in India's Char Dham pilgrimage. Badrinath is in the Garhwal hills, on the banks of the Alaknanda River, at an elevation of 3133 m.
Vasudhara Waterfall, 8 km from Badrinath. The first 3 km can be travelled by a car or a bus. This stop is called "Mana". First point after the village Mana, the last habitat in the indian side, is Bhim Pool. This is said to have been built by Bhim for his wife Draupadi who could not cross the ridge. From here there is a 4 km trek for the falls and no special gear for the trek is needed, only some good shoes. Hot Geyser. There is a hot spring near the temple, and many saints live in the surrounding mountains all year round despite the harsh winter at such high elevations. origin of saraswati river, near mana village. this is said be origin of Saraswati river coming out and going underground again as this river is not visible anywhere from source upto Allahabad Sangam in UP where it is said to merge into Ganga river along with Yamuna river.Very close to visible river Saraswati there is very small water stream said to be water from Mansarover Lake in Tibet. Ancient coins, Wool, Ayurvedic medicine, Holy books, Counterfeit Electronic goods from China,sacred threads, sea shells, temple requirements, aarti booklets, colourful beads and braceletes. Indian and only vegetarian food. Non vegetarian foods are not allowed on this pilgrimage route beyond Rishikesh. There are several eateries around the temple some of which have decent eating atmosphere. Do not expect luxury as all business here are seasonal. All shops remains closed after the yatra season is over. No alcohol permitted,but (illegal) marijuana, etc is widely available. Lots of hotels and Ashrams If you are low on cash you can always stay in Ashram,Food is also provided by ashrams. If you are adventurous you can bring along your tents and camp here. There are some local who can also provide you ready made tents to stay too. This page was last edited on 27 February 2019, at 08:48.